What do you do after you go on a multi-pork-roll-food-crawl down oxford street? Walk to Surry Hills to get dessert, of course! 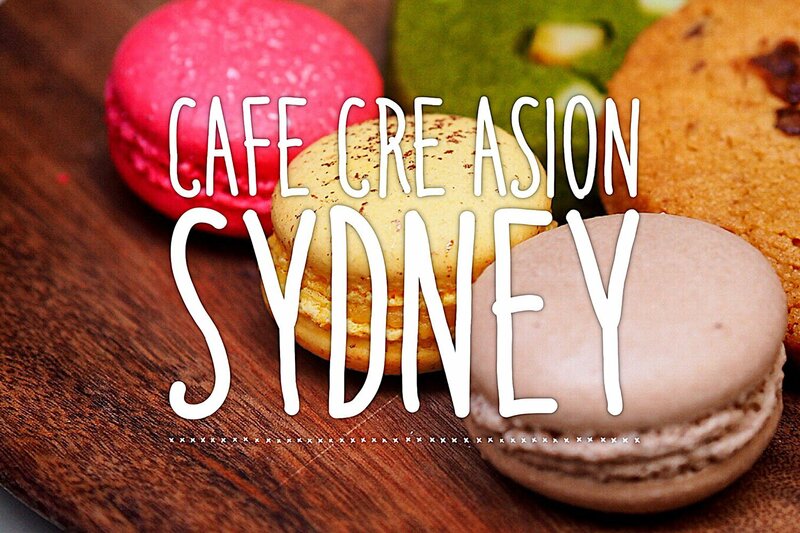 And that’s how we found ourselves at Cafe Cre Asion (how do you even pronounce that, anyway?) ordering cookies, macarons and tea on an incredibly full stomach. This Asian dessert cafe has all the usual suspects…suspect. Matcha features in many of the menu items, including their famous matcha lattes. The latte was okay, iced, but what really blew me away was the enthusiasm of the service. Sure, there were a few mixups, but they all looked so happy to be there. The macarons were also surprisingly good as well – the roasted rice had a lovely savoury quality to it, and the lychee had an amazing perfume. A nice place to have afternoon tea with a friend, or takeaway some treats. Be careful of rocking up with big groups though – it’s quite a small space that’s really more suited to uh, intimate catchups. Or you know, you could just go by yourself and stuff your face with macarons like I wish I did! God, I love Cre Asion so much. I can’t wait til they get a bigger venue. Mmm yuzu lemonade. I swear those macs were the best I’ve ever had! !